I think he's looking for spring. Indiana seems to have misplaced it. I got my 'Wow' lesson, and it was the hardest walk lesson of our lives. My trainer likes to save up training rides from my missed lessons and give him a pony boot camp when she feels we're stuck, or headed towards being stuck, or facing something like the clinic, so she rode him Wednesday and Thursday. Turns out she felt the same things I did, only she A) properly identified what was going on and B) has the tools to fix it. This is not a knock, it's an observation: I am terrible without a trainer. The wheels just slowly start coming off and the pony slowly starts getting heavier and less responsive without lessons. Three weeks away was too much, thanks, work. My observations were: I lost control of the shoulder, and he's carrying his nose to the right especially when going to the right. Her observations were: he's arm-muscle destroyingly heavy, he's popping his shoulder to the right when going left, he's trying to take the left rein again, and while I fixed the forward issue she told me to work on last time, I sacrificed lightness for forward when I really want both. To the left, she had me establish a real left bend, and was constantly reminding me that sometimes I was going to have to be pretty firm because I needed enough left rein to be able to correct the outside shoulder with the right rein without throwing him off. Once she pointed it out, I could feel that the second we turned any corner, out went that shoulder. So to the left, we did a square with that crazy (to me) left bend, a shoulder in on the sides, and a turn on the forehand to go around the corners. She had me focus on keeping both hands slightly left (inside), keep my weight centered, stop bracing with my right leg/turn my toe and knee out, and focus on the timing of my aids. Suddenly, there was my light, responsive, bit-chewing, slobbering suckerfish of a pony again. To the right, his problems are different, so for this she had me think about a counterbend, when in reality I was just keeping him and his wayward jaw straight. Again we did the square, but this time with a turn on the haunches for the turns, focusing on keeping him in that left rein and bringing the shoulder around. 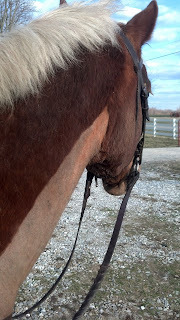 Muscularly, he has more trouble staying correct to the right, so we didn't work quite as long here. Finally, when he was going well, we trotted until he got heavy (sometimes 1/4 of a 20m circle! ), re-established lightness at the walk, trotted until he got heavy, rinse, repeat. Through it all she kept explaining and asking me questions, because she said unless I really understood WHY we were doing all this, it wouldn't really be effective in the long term. I think I do, which is why I wanted to work through it in this (long, sorry) post. I know it's hard without seeing him, but I am really interested in talking through this with people. Thoughts? I've been feeling a lot of the same things. My Oliver sometimes has the same issue to the right, where he wants to overly bend right and pop out his left shoulder, so I feel like I'm counter-bending to keep him straight. Last lesson, my trainer told me "Only work in softness and lightness. If you don't have softness in the walk, don't start leg yielding, or trotting, get soft and then get moving"
I really like how your trainer worked with you to help fix him. Not surprising, I use the same methods with Comrade. Understanding the tools she is giving you and when to use them will come. I agree with Steph's trainer, work each level before moving on. Build a strong foundation. One thing, I don't think you sacrificed lightness to get forward. Until you have forward especially with these Cobs, it is hard to ask for the exercises to get lightness. Being able to move the whole body will make moving individual parts easier. I agree with Nicole - I can't get an exercise correct with Riva unless she is forward. Maybe she has some Cob in her!